Some things never change. This past week, because of the impending 30th anniversary of John Lennon’s death, The Beatles music and influence seemed even more inescapable than usual in both media and conversation. How intense was it? Forget the lame iTunes announcement; to the horror, one would imagine, of a healthy portion of its viewers, even Fox News ran an hour-long special called “Fox News Reports: The Last Days of John Lennon.” Here locally, along with the usual “War is Over” banners that pop up this time of year, lyrical idealism could be celebrated at a Wednesday night gathering of Lennonites at Old Town Coffee & Chocolates. Like it or not, the nerve the Fab Four hit is still throbbing. As one of the most influential musical groups in history, it seems only natural that The Beatles are also one of the most covered groups. Licensing fees be damned. 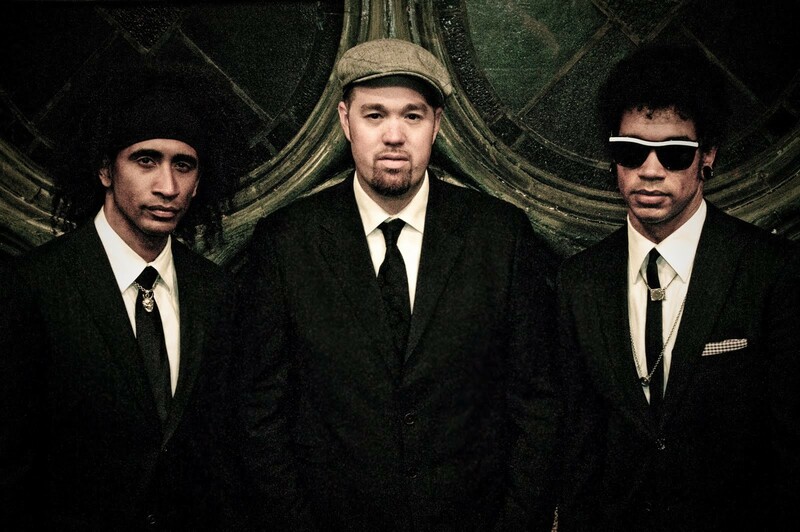 Though it might seem like an odd career move for a critically acclaimed, Hammond B3 organ-led funk/soul instrumental trio to make, the members of Soulive decided to ignore the inherent risk in attempting to breathe new artistic life into a bunch of songs that people have heard, oh, a zillion times and indulge their less obvious Liverpudlian influences. With a little more than 10 years in the pocket together, Soulive has managed to check a lot of boxes in the “people worked with” and “places played” columns. The New York-based group has opened for Stevie Wonder and The Rolling Stones, recorded with Dave Matthews, Talib Kweli, Robert Randolph and Chaka Khan and toured extensively in Japan, through most of Europe, as well as Russia, Brazil and Ghana. Next stop, HumCo, a place still enough in love with the 1960s to boast a population riddled with Beatles fans who likely would have never experienced Soullive had the group not “gone mop top” on their latest album and subsequent tour. Released in September, Rubber Soulive presents 11 of The Beatles' most familiar melodies in restrained but upbeat arrangements. The songs -- which, to be clear, are not comprised solely of Rubber Soul tracks -- often feature guitarist Eric Krasno handling melody lines, drummer Alan Evans hitting those skins with significantly more drive and nuance than Ringo could have mustered on his best day, and Neal Evans filling in the holes with tasty B3 soundscapes. (You can listen to a handful of excerpts from the tracks on Soulive’s label’s website, www.royalfamilyrecords.com.) As you might assume would happen when an accomplished jazz group leans into three-minute pop dittys, the songs themselves often act as the framework for longer, more virtuosic instrumental workouts. You can’t trust jazz dudes to color in them lines. You can watch those lines get scribbled over this Sunday when Soulive gets all Beatley at HumBrews in Arcata. On this west coast swing of their tour, the trio will be accented by the presence of San Diego saxophonist Karl Denson who, for many years, played in Lenny Kravitz’ band. Speaking of dreadlocks, weed enthusiasts have something to look forward to this coming weekend when the Mendocino County Farmers Collective celebrates this year’s harvest with its 7th Annual outdoor organic cannabis competition known as the Emerald Cup. If you’re jonesin’, down for a trip to Laytonville and unfazed by the $80 entrance fee ($100 at the gate), Area 101 will be your one-day-only Weed Mecca this Saturday. Oh, and make sure you have your 215 card. That’s kinda important. Laws and stuff. For competitive growers and smokers, the main event will be the day’s list of lighthearted contests ranging from joint rolling, “guess the roaches in the jar,” “best new strain,” “highest CBD content,” “biggest stalk” and more. Prop comedian, one-time "The Simpsons" guest star and David Crosby-lookalike Bruce Baum will be on hand to supply some yuks, but we mention the E-Cup here mainly because of the impressive size of the list of musicians slated to play. Attenders can toke down to (surprise!) mostly reggae or at least reggae-influenced acts including Lion Camp and the Redemption Band featuring Ishi Dube and Jah Sun, Gaudi, BLVD, Lukas Nelson and Promise of the Real, G.A.M.M.A., Heyoka and Vibesquad, among others. Good blackjack lesson: Never split a winning hand. Some reggae closer to home? On Thursday, Night Nurse brings seasoned Jamaica natives The Abyssinians back to the Red Fox Tavern. “Seasoned” = the group has been playing together in one incarnation or another since 1968. That’s a lot of off-beat accents. The global grooves continue Saturday night at Humboldt Brews with a polyrhythm-heavy bill that features the Humboldt Calypso Band, SambAmore and Club Cubano with the Humboldt State World Percussion Group. Finding out how they plan to fit all those groups into the green room of HumBrew’s Next Door music room may be worth the price of admission -- which, by the way, they have a special deal for: $7 per person, or $10 for a pair. (Psst... they want you to bring a friend.) Despite earlier reports, Womama will not play that night. So you know. Did folksy singer/songwriter and sometimes KHUM DJ Chris Parreira play out more than any other (non-casino-performing) local artist this year? I’d take that bet. Chris wraps his busy 2010 with a couple of shows pairing him with musical friend John Craigie. Chris explains the format: “Instead of us each having our own set, we'll both be on stage at the same time all night, swapping songs back and forth. John will play some lead guitar and harmonica on my songs, I'll play some light percussion and sing harmonies on his stuff, and we'll mix it up and play different tunes each night.” You can catch the two at Six Rivers Brewery on Wednesday, Dec. 15, and at Mad River Brewery Thursday, Dec. 16. In a similar vein, Monday is the third monthly installment of the Songwriters in the Round SongSwap at Mad River Brewery. Host Morgan Corviday will be joined by the always musically interesting pair of John Ludington and Andrea Zvaleko. If you like songs, stories and witty banter, go. Rounding out the week of song circles, Seabury Gould hosts one Wednesday in the Arcata Library Conference Room. One seismic landscape shift to report: For specifically low-on-gas-money Eurekans whose secret nighttime karaoke dreams were destroyed by the closure of The Boiler Room -- a larger crowd than we’ll probably ever know -- we have good news. The Pearl is filling the gaping Eureka karaoke hole with its own Accurate Productions-hosted night of wailing. You may exhale. Significantly more enticing is the special performer who will grace the stage at the Red Fox Tavern on Saturday night. In his homeland, Thomas Mapfumo is known as “The Lion of Zimbabwe.” While you may have seen him perform in England with his band The Blacks Unlimited if you watched all of Bob Geldof’s marathon Live 8 concerts, he is best known back home for the musical role his songs of revolution played in helping to push along Zimbabwean independence from the U.K. in 1980. That year saw Zimbabwe’s first free elections and Mapfumo played at a large-scale celebratory concert that also featured none other than Bob Marley. Here’s the downside. The guy who came to power in those 1980 elections? Robert Mugabe. Now, the problem that revolutionary singers create for dudes like Mugabe is that they keep singing. End result? Since 2007, Mapfumo’s music has been banned by the government it helped bring to power and the singer lives in political exile in the U.S. How does Thomas feel about it? He’ll sing it for you on Saturday.